The Toshiba Satellite Pro C660-2F7 is exactly what you would expect from a low priced laptop. It has an unattractive plastic black chassis, only two USB ports, 2GB of RAM and a rather uncomfortable keyboard. But inside there's a Sandy Bridge processor, numeric keypad, excellent touchpad and 320GB of hard drive space. The design hasn't changed much from previous incarnations of the Satellite Pro C660, such as the Toshiba Satellite Pro C660-1UX. Although Toshiba has given it a dimpled texture and the plastic stops fingerprints and smudges from forming, you're still very aware that this is a budget machine. There's a definite flex around the chassis, mainly around the optical drive and the touchpad. The keyboard is packed in tightly and has a very shallow travel that takes some getting used to. It's slightly cramped in places, but there's a dedicated numeric keypad that should appeal to anyone who uses Excel regularly, or wants a laptop to keep track of the family budget. We didn't mind typing on the keyboard too much and Toshiba appears to have fixed an annoying rattle that cropped up when typing on previous version of the C660. There are only two USB ports on the Toshiba Satellite Pro C660-2F7, and although Toshiba has provided a VGA connection, you won't find an HDMI port for a high-definition connection to an external monitor. However, there is an SD card slot to expand the 320GB of internal storage, and you have the trusty DVD optical drive - something that's fallen out of favour with high-end slim laptops. Despite the poor build quality, we found the screen to be bright and quite well suited to watching movies, thanks to the glossy Super-TFT coating. Even though the coating is reflective, we didn't find brightly lit environments as much of a problem with the Toshiba Satellite Pro C660-2F7 as we have with other machines. The 1,366 x 768 pixel resolution keeps your photos and videos looking crisp, and the 320GB hard drive gives you a decent amount of space to store your media. The Toshiba Satellite Pro C660-2F7 is built around a second-generation Intel Core i3 dual-core processor. This is an upgrade from the previous model, and the difference shows. The Toshiba scored well in our benchmarking tests, and we feel that novice users will find this laptop easily meets their needs. The graphics card is an integrated Intel chip that will handle basic demands, but demanding programs will be outside its remit. It isn't all good news though, and the inclusion of only 2GB of RAM is a disappointment. While it will run the majority of programs without much trouble, the lack of RAM means this laptop will age quickly as software advances. 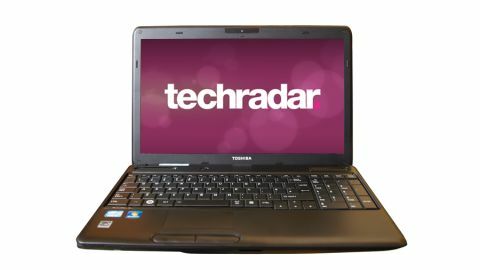 While the performance of the Toshiba Satellite Pro C660-2F7 is geared towards basic users, we feel that for its £390 (about $630) price tag it would provide a reasonable purchase. Unfortunately, it can't match some other machines - such as the Lenovo B570 - for value for money, but Toshiba has a good reputation for budget machines and the C660 is a what-you-see-is-what-you-get entry-level machine. The Sandy Bridge processor goes a long way to updating a model that was once below-par, and we feel that you should get a comfortable two or three years from this laptop.